These are few brief experiences which you will find equally interesting. Sai Sister Taraka ji from India says: HI Hetal Ji, This is Taraka from India. You are doing a great job by posting all these experiences. I am a regular reader of this blog. I would like to share 1 of my experience, which I had yesterday. Please post this experience. I and my husband went for watch shop in Ameerpet yesterday. As it is festival season, it is very busy with heavy traffic. We did our work and I wanted to buy 1 dress for me. I went to other shop asked my husband to park the car. He was outside the shop. I bought 1 dress for me and I came out. We crossed the signal and then I saw my bag. Buckle is not there. Without Buckle, my handbag is not looking good. It’s my new handbag. So I asked my husband to go to that shop again. He said ok. But while taking "U" turn traffic is very heavy and my husband started shouting on me. He is not interested in coming again to that shop. I was very upset and chanted "Om Sai Ram" repeatedly. We don’t know whether we get Buckle or not. If I don’t get it, I have to bare my husband shouting. I am really scared a lot. I told to Baba if I get my Buckle, I will post this experience in this blog. To my surprise, I went to that merchant shop and I started searching for it. They asked me what I am searching for. I told them same thing that I lost my bag buckle. One boy came to me (with full white dress) and told me that he saw and kept aside. But he has forgotten where he kept. He started searching for it. After 5-10 minutes, same boy (with full white dress) came to me and gave me Buckle. I can’t tell you in words. I got tears in my eyes and told him Thanks whole heartedly. I felt so much happy and told lots of thanks to our beloved SAI. I told all this to my husband. He said it’s ok.
Last month, I have faced tough phase in my family life. I use to cry a lot. My husband shouted on me for small reasons. I use to cry in front of Sai idol. But now, I am happy with the blessings of SAI. If I had written any mistakes, please forgive me. I am bit poor in English. Anonymous Devotee says: Dear Hetalji, Please post this on your Blog. I will be very grateful. Please do not disclose my name or email Id. Thank you so much. May Baba Bless you abundantly. Om Sai Ram. Baba has been saving me in all moments from big troubles and calamities. He has been there for me and even helped me to come out even from my smallest worries and anxieties. Baba has been Helping me and supporting me continuously and saving me from all the calamities. Thank You Babaji for Your Merciful Hand and Kind Glance and Loving Grace on me always. I am indebted to You for my life. With Baba’s Grace, I was saved from a big calamity. There came 2 proposals for my marriage. My heart did not say yes to either of them and I prayed to Baba sincerely and whole-heartedly. Babaji, please cancel both these proposals. Baba, As He is Kind and Compassionate, He listened to my prayers and cancelled both the proposals and I was so happy. I am so relieved now. Thank You so much Sai Baba. You have saved me from big calamity. I have faith that Baba has chosen someone special for me, whom I will like very much. Thank You Sai Baba so much for Your Love and Affection and Ample Grace showered on me. Thank You Baba. I have full faith and trust in You Babaji. Om Sai Ram. Anonymous Devotee from India says: Dear Hetal Ji, I wish to be anonymous. Here is just one of the many blessings and experiences He has drenched me in. 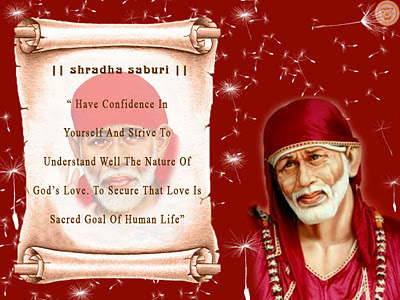 I am a devotee of Shirdi Sai Baba. I only consider myself fortunate that I have Baba's hand, which I can tightly grasp and move on in life. Let me go directly to my experience. I and my husband had been planning a Shirdi trip for some time. We planned it in such a way that we would be there at Sai Darbar on our wedding anniversary. After Shirdi trip, we had planned to spend a couple of days in Mumbai, just going around the place, shopping, playing at the beach etc. That was our initial planning. All bookings etc. were made. It was the time to leave. It was morning and the taxi was waiting and we probably had about twenty minutes to leave home. Just then, I realized my diamond ring was missing. I remembered removing it the previous day, when I was oiling my hair. But completely forgot where I had kept it. My head was blank totally. Usually I am somebody, who would keep jewels and other things quite carefully in designated places. But this time different. My husband was ready, loading things into the car, my two year old daughter was by my side babbling something and I was frantically running around and looking for it in all possible places. The ring was gifted to me by my dad and it is very dear to it. I have been wearing it for more than 8 years. And, as usual, I started praying to Baba asking Him to find it for me. That very moment, my daughter showed me something and said 'here mummy'. And she had the ring in her hand. At that time she was two years and five months old. There was no way she could understand things like 'ring' or 'diamond' or anything of that sort. I am very clear it is Baba who gave it to my daughter asking her to give it to me. Finding of the ring helped me in more than one ways, else, looking for it. I could have missed the flight, or my mind would have been on that ring for all the five days. I would not have been peaceful in Shirdi. The Shirdi-Bombay trip we planned, was a goof up in more than one way. My husband fell ill. In fact, I was doubtful, whether we would even have a Darshan of Baba on our anniversary. He could not pull himself to even to sit on the bed, forget standing in the queue for 1-2 hours. But, we somehow, by His grace, managed to have one very satisfying Darshan of Baba. Even the Bombay trip was very bad and we were more than relieved to be home. But still, if the ring had been missing, it would have made matters worse. I thank Baba for relieving me of that tension and giving me one extremely satisfying Darshan. There are many such experiences, both big and small. I would write more about them later. Thanks again, Hetal ji, for publishing this. May Baba bless you and your family with loads of good health, peace and prosperity. Babaleaves His devotees free of worry by offering that knowledge for which the devotee worries. very nice experiences! Hetal Ji, thanks for this wonderful blog and thanks for this noble service. very nice pic..i really liked it.I also took the print out of this. I really like this blog and am a regular reader of the devotees experiences as it is very inspiring and my faith doubles and makes me satisfied.